Combining active externalism in the form of the extended and distributed cognition hypotheses with virtue reliabilism can provide the long sought after link between mainstream epistemology and philosophy of science. Specifically, by reading virtue reliabilism along the lines suggested by the hypothesis of extended cognition, we can account for scientific knowledge produced on the basis of both hardware and software scientific artifacts (i.e., scientific instruments and theories). Additionally, by bringing the distributed cognition hypothesis within the picture, we can introduce the notion of epistemic group agents, in order to further account for collective knowledge produced on the basis of scientific research teams. I am grateful to J. Adam Carter and John Greco for very useful discussions on the topic and feedback on previous drafts. 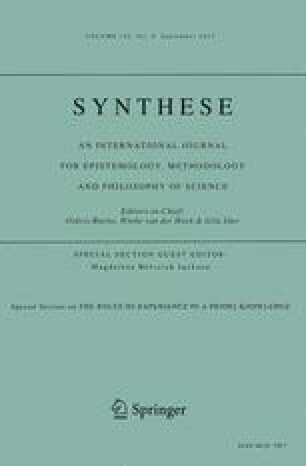 I am also thankful to two anonymous referees for Synthese for their particularly insightful reviews. Research into the area of this paper was supported by the AHRC-funded ‘Extended Knowledge’ Project, based at the Eidyn research centre, University of Edinburgh. Froese, T., Gershenson, C., & Rosenblueth, D.A. (2013). The dynamically extended mind. Retrieved http://arxiv.org/abs/1305.1958. Gilbert, M. (2007c). Remarks on collective belief. Socializing Epistemology: The Social Dimensions of Knowledge 1994. Retrieved at SSRN: http://ssrn.com/abstract=1052361. Logan, K.R. (2003). The extended mind: Understanding language and thought in terms of complexity and Chaos Theory. In D. McArthur & C. Mulvihil (Eds.) Humanity and the Cosmos. Retrieved http://www.upscale.utoronto.ca/PVB/Logan/Extended/Extended.html. Markie, P. (2013). Rationalism vs. empiricism. In: E.N. Zalta (Ed. ), The stanford encyclopedia of philosophy (Summer 2013.) Retrieved http://plato.stanford.edu/archives/sum2013/entries/rationalism-empiricism/. Palermos, S.O. (2013). Could reliability naturally imply safety?. European Journal of Philosophy. doi: 10.1111/ejop.12046. Seibt, J. (2012). Process Philosophy. In E. N. Zalta (Ed. ), The stanford encyclopedia of philosophy (Fall 2013 Edition). Retrieved http://plato.stanford.edu/archives/fall2013/entries/process-philosophy/.